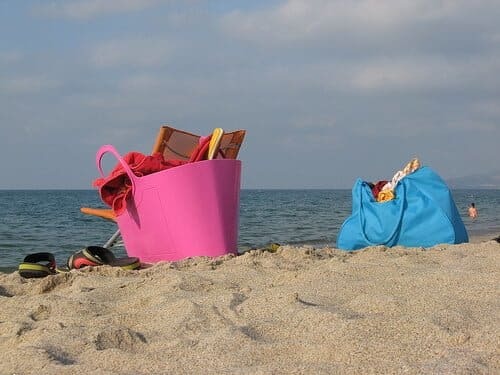 Here are the steps that will help you to make some cute beach bags at home! This project can help you use your old shower curtains. Pick a shower curtain that can be attached to fabric. Your curtain should not soak up water or getting ruined due tochlorine water. Choose a hookless shower curtain from Target. Check out the white and brown Escape curtains online. Made from 100 percent polyester, these curtains are water-resistant, mold resistant and mildew resistant. Go for some more colorful curtains if you want to have a peppy beach bag. Take a large piece of fabric and fold it in half. Cut out the extra fabric and give your bag the desired round bottom. Your fabric should be 26 inches wide and 20 inches tall when it is open. You can make your bag as tall and as wide as you want. Now, fold your shower curtain in half. Its ring holes should be on the top. Place the fabric on the curtain and pin it. Your fabric and curtain should be of the same size and shape. Cut out a rectangle from the fabric. Now, sew along the open sides of the straps. Sew the ends of your straps with the bag’s top. You should now be able to lift up the bag with the help of these straps. Pick a piece of coordinating fabric and cut a square out of it. Now, sew only three open sides of the fabric with the front side of your bag. Leave an opening on the top of the pocket. Your beach bag is now ready to store garments, sunglasses, sunscreen lotions and much more for you! You can make a chic beach bag and gift it to your loved one as well!